The time needed to develop products for CC-Link IE Field networks can be dramatically reduced using the Seamless Message Protocol (SLMP) technology of CC-Link IE, the unique gigabit open industrial Ethernet network. Typically most companies are considering hardware and software development when they plan new product development. This means two separate sets of development activities need to be undertaken, each with its own time and cost burdens. SLMP is a new approach that could potentially halve the time taken to bring a CC-Link IE Field product to market. CC-Link IE Field is the version of CC-Link IE that connects controllers to field devices at gigabit speeds. The secret is to skip the hardware part completely and simply adapt an existing device. Since CC-Link IE Field is based on a standard Ethernet physical layer, the hardware development has effectively been completed on any product that already connects to an industrial Ethernet network. Hence the only part that remains is to implement the SLMP communications in software on the existing device. Once implemented, any Ethernet enabled product can communicate with other devices on a CC-Link IE Field network via a gateway device. Hence effectively any suitable existing device can be adapted to connect to the network, rather than having to develop something from scratch. The benefit is that now potentially any Ethernet device can connect to a CC-Link IE Field network. This means that the pool of available devices is effectively only limited by the devices on the market. As well as standard industrial Ethernet devices such as HMI, PLCs, drives and other products, now more varied devices such as label printers, barcode readers and RFID systems can also connect. In addition to the hardware of the product remaining unchanged, and reduced development times being possible, a third benefit is that conformance testing requirements for the product are simpler, as only the software functions need to be tested. 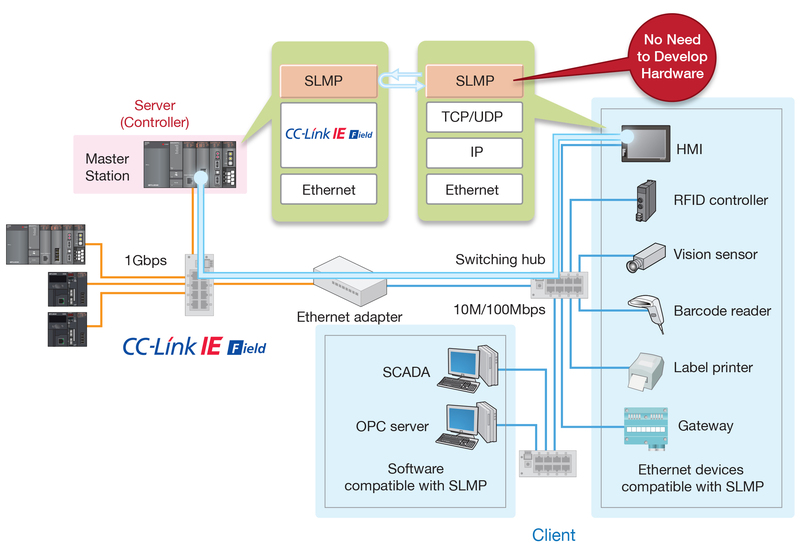 SLMP is a simple client/server type protocol, and so can be easily implemented into firmware for 100Mbit/s Ethernet devices from third-party vendors and then connected to CC-Link IE field via an Ethernet adapter. Any device connected in this manner can then be accessed across the network. Similarly, the Ethernet-compatible device can then access all other devices connected to the CC-Link IE Field network.